It was a fabulous day today, lovely weather, great birds and some exciting finds. I left the village at 8am together with Mike and Lindsay, we headed for the coast making one stop to collect my other two passengers Peter and Penny. Whilst waiting for P & P we scanned the nearby mountainside and found a pair of Red-billed Chough and several Griffon Vultures. It took about 45 minutes to get to our first destination which was a raptor watch-point situated on the slopes above Algeciras heading towards Tarifa. The watch-point, called Al Gorrobo, was very busy with many birders watching the sky and counting raptors. The sky wasn't full of birds but we had bursts of activity. At times there were 100 birds above us and many more were dotted over the hills. Honey Buzzards were the dominant species but many Black Kites, Griffon Vultures, Booted Eagles, Short-toed Eagles and Sparrowhawks were also seen. A Peregrine was found perched on a pylon, 3 Egyptian Vultures circled in rhe distance and large flocks of Alpine Swifts passed by. Much lower down we found a couple of Golden Orioles and many Spotless Starlings. We then drove on towards Tarifa stopping at Cazalla which is another of the raptor watch-points, it was crowded with birders, we had just missed a Lanner Falcon sighting but we all saw a Long-legged Buzzard which drifted right over the top of us. Some of the raptors were much closer here and we enjoyed our stay there but we moved on after about an hour. At La Janda we had a great time cruising the tracks and trails stopping every so often to scope a sighting. 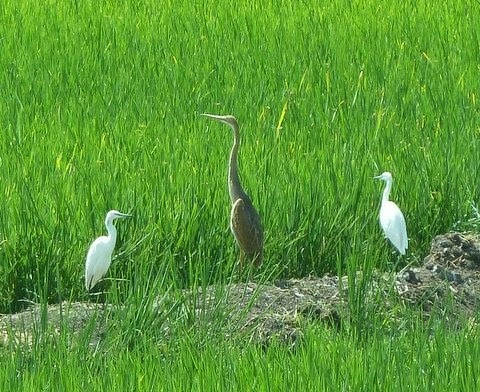 We saw lots of Green Sandpipers, Corn Buntings, Little and Cattle Egrets and huge numbers of White Storks. A Purple Heron sat on a bank with a small group of Little Egrets, many sandpipers fed in one of the rice fields, several Montagu's Harriers skimmed the rice and a few Marsh Harriers searched the rough pastures and ditches for lunch. Above us there were always groups of White Storks, flocks of Wood Pigeon and the occasional raptor. We drove onto the track to the 'smelly farm' sighting a single Turtle Dove and more flocks of Goldfinches, Linnets and Sparrows. Our picnic lunch was taken along this track and whilst eating we saw two Bonelli's Eagles circling above us. Following lunch we continued to the 'smelly farm' stopping on rhe rise just before it, this was a known site for roosting Nightjars and within minutes we located a couple of them sitting in a shady spot in the leaf litter. After that excitement we srove onto the Benalup track passing the farm where a flock of Jackdaws were seen. At a small pool near Benalup we watched a group of Glossy Ibis before seating off back across La Janda towards Vejer. A couple of stops produced some good birds, the first was a Black-winged Kite perched high up on a pylon and the second stop was to watch hundreds of Glossy Ibis and thousands of White Storks in the rice fields, a good number of Black-winged Stilts joined them. We left La Janda and drove towards Vejer turning off onto a golf course where we searched for Bald Ibis, sure enough a small flock of these reintroduced rare birds was found, ugly but nice to find. From the golf course we drove round to Barbate Marshes on the coast, it was still pretty warm but a nice breeze kept us cool. Huge numbers of gulls 'loafed' on the large open islands in the centre of the marshes, we saw over 50 Audouin's Gulls and hundreds of Yellow-legged Gulls, Lesser-black Backed Gulls and a few Black-headed Gulls. Wader sightings included Sanderling, Ringed Plover, Redshank, Bar-tailed Godwit and Common Sandpiper. A few Little Terns fed nearby and a small group of Eurasian Spoonbills fed in the near distance. We left the area at 5pm making only one stop at the mirador Estrecho where the views to Morocco were fantastic in the brilliant afternoon light.